2017 Nissan Titan SV RWD 5.6L V8 CARFAX One-Owner. Great Condition, Hard to Find, One Owner, Clean Carfax, SMARTPHONE CONNECTIVITY - BLUE TOOTH, Mention this advertisement to the dealer to receive the advertised price., LIFETIME WARRANTY ON ENGINE AND TRANSMISSION.<br><br>Congratulations on choosing a vehicle that has our exclusive Lifetime Warranty. This warranty is good for the Lifetime of the vehicle...Unlimited Miles and Unlimited Time, free Car History report with Buyback Protection. This vehicle has passed our 156 point inspection and is covered for as long as you own the vehicle. Every vehicle we sell qualifies for our exclusive no hassle 5 day exchange policy. We also provide a 30 day limited comprehensive warranty on any vehicle we sell that has under 70K miles at time of delivery. Hudson Nissan is proud to serve Charleston, Mt. Pleasant, Summerville, Goose Creek, Columbia and surrounding cities in South Carolina. We are the number one volume Nissan store in the state of South Carolina 5 years in a row; Call Now! (843)553-1000 or check us out online at www.myhudsonnissan.com to see why we make truly exceptional customer service our number one priority! We now offer free delivery within 300 miles.Prices include $556.63 closing fee. Buyer is responsible for all state, county, and city taxes, tag, title, and registration fees in the state in which the vehicle will be registered. Offer good while supply lasts. 2018 Nissan Titan SV COMFORT AND CONVIENCE PKG RWD 5.6L V8 CARFAX One-Owner. Rear Backup Camera, Navigation/Nav/GPS, Like New, Great Condition, Low Mileage, Hard to Find, One Owner, Clean Carfax, Mention this advertisement to the dealer to receive the advertised price., LIFETIME WARRANTY ON ENGINE AND TRANSMISSION, CERTIFIED PRE OWNED NISSAN, HEATED FRONT SEATS, 4-Pin/7-Pin Wiring Harness Connector (Rear Bumper), Auto-Dimming Rear-View Mirror, Automatic On/Off Headlights, Blind Spot Warning w/Rear Cross Traffic Alert, Chrome Interior Door Locks, Convex Spotter Mirror, Dual Zone Automatic HVAC, Front & Rear Parking Sensors, Heated Front Captain's Chairs, Intelligent Key System, Leather-Wrapped Steering Wheel, Navigation System, Painted Rear Bumper, Power Sliding Rear Window w/Defogger, Radio: Nissan Navigation System w/Voice Guidance, Rain Sensing Wipers, Rear Air Conditioning Vents, Receiver Hitch, Siri Eyes Free, SV Convenience Package, Universal Garage Door Opener.<br><br>Congratulations on choosing a Nissan Certified Pre-Owned vehicle that also has a Lifetime Warranty. This vehicle has passed a 156 point inspection and comes an 84 month/100K mile warranty, 24 Hour Roadside Assistance, 2 keys, owner's manual, Certificate of Inspection, towing coverage, car rental coverage, trip interruption benefits up to $500, available Certified bumper to bumper warranty for only a few dollars more a month, and more. List price includes $456.63 closing fee. The Lifetime warranty is good for the Lifetime of the vehicle...Unlimited Miles and Unlimited Time and also comes with a free Car History report with Buyback Protection. Call one of our Internet Sales Consultants at 843-553-1000 for more information about the CPO benefits or Lifetime Warranty information. Every vehicle we sell qualifies for our exclusive no hassle 5 day exchange policy. We also provide a 30 day limited bumper to bumper warranty on any vehicle we sell that has under 80K miles at time of delivery. Hudson Nissan is proud to serve Charleston, Mt. Pleasant, Summerville, Goose Creek, Columbia and surrounding cities in South Carolina. $556.63 Dealer fee included in List price. 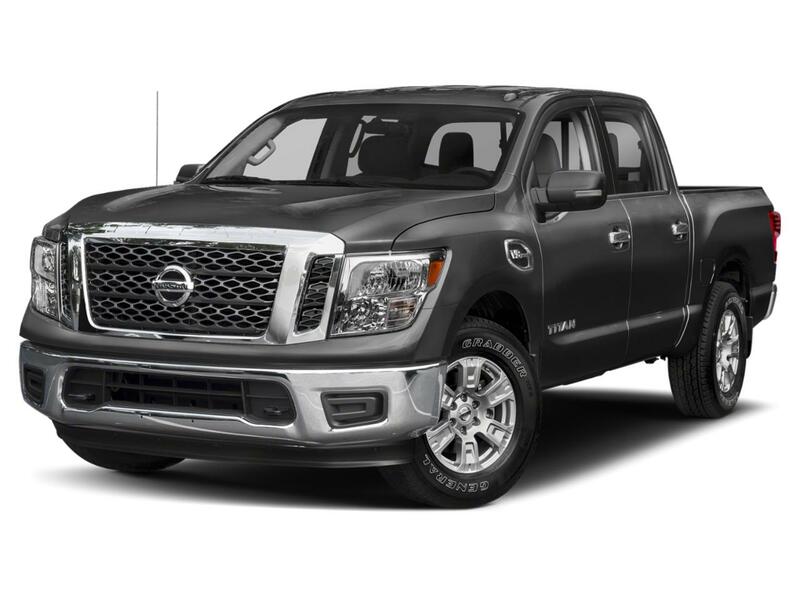 2018 Nissan Titan SV RWD 5.6L V8 CARFAX One-Owner. Odometer is 643 miles below market average! Rear Backup Camera, Navigation/Nav/GPS, Like New, Great Condition, New Tires, One Owner, Clean Carfax, SMARTPHONE CONNECTIVITY - BLUE TOOTH, Mention this advertisement to the dealer to receive the advertised price., CERTIFIED PRE OWNED NISSAN.<br><br>Congratulations on choosing a Nissan Certified Pre-Owned vehicle that also has a Lifetime Warranty. This vehicle has passed a 156 point inspection and comes an 84 month/100K mile warranty, 24 Hour Roadside Assistance, 2 keys, owner's manual, Certificate of Inspection, towing coverage, car rental coverage, trip interruption benefits up to $500, available Certified bumper to bumper warranty for only a few dollars more a month, and more. List price includes $456.63 closing fee. The Lifetime warranty is good for the Lifetime of the vehicle...Unlimited Miles and Unlimited Time and also comes with a free Car History report with Buyback Protection. Call one of our Internet Sales Consultants at 843-553-1000 for more information about the CPO benefits or Lifetime Warranty information. Every vehicle we sell qualifies for our exclusive no hassle 5 day exchange policy. We also provide a 30 day limited bumper to bumper warranty on any vehicle we sell that has under 80K miles at time of delivery. Hudson Nissan is proud to serve Charleston, Mt. Pleasant, Summerville, Goose Creek, Columbia and surrounding cities in South Carolina. $556.63 Dealer fee included in List price. 2017 Nissan Titan SL RWD 5.6L V8 Mention this advertisement to the dealer to receive the advertised price..<br><br>Congratulations on choosing an used vehicle from Hudson Nissan on Rivers Avenue. This vehicle has passed our 156 point inspection and comes with a free Carfax with Buyback protection. We also provide a no questions asked 5 day exchange policy on every used vehicle we sell. Also, every vehicle under 70K miles at time of delivery has a limited bumper to bumper 30 day warranty. Call one of our Certified Internet Consultants at 843-553-1000 to get more information about this used vehicle. Hudson Nissan is the number one volume Nissan store in the state of SC 8 years in a row. We accomplished this by making truly exceptional customer service our number one priority. Check us out online at www.myhudsonnissan.com to see our specials, or one of our 500+ vehicles we have in stock. We now offer free delivery within 300 miles, call for more details. Hudson Nissan is proud to serve Charleston, Mt. Pleasant, Summerville, Goose Creek, Columbia and surrounding cities in South Carolina. Online price includes $556.63 closing fee. Buyer is responsible for all state, county, and city taxes, tag, title, and registration fees in the state in which the vehicle will be registered. Offer good while supply lasts. CALL TODAY 843-571-2810 TO CONFIRM AVAILABILITY. OR VISIT US IN WEST ASHLEY AT 1714 SAVANNAH HWY CHARLESTON, SC.<br><br>** EXCLUSIVE NATIONWIDE LIFETIME POWERTRAIN WARRANTY. UNLIMITED TIME AND MILES **, ** NISSAN CERTIFIED PRE-OWNED **, ** REAR BACKUP CAMERA **, ** GPS/NAVIGATION **, **BLUETOOTH**, Streaming Audio/USB/AUX, Cruise Control, Heated Seats, Sirius/XM Satellite Radio, Push Button Start, Bed Liner, Tow Package, Low Mileage, Power Locks and Windows, Great Condition.<br>2018 Certified. Nissan Titan 4D Crew Cab Glacier White SV NAV/PUSH BUTTON Nissan Certified Pre-Owned Details:<br><br> * Warranty Deductible: $50<br> * Transferable Warranty (between private parties)<br> * Limited Warranty: 84 Month/100,000 Mile (whichever comes first) from original in-service date<br> * Vehicle History<br> * 167 Point Inspection<br> * Roadside Assistance<br> * Includes Car Rental and Trip Interruption Reimbursement<br><br>Clean CARFAX. CARFAX One-Owner. RWD 7-Speed Automatic 5.6L V8 Odometer is 9741 miles below market average!<br><br><br>Price includes motor vehicle closing fee. Buyer is responsible for state, county and city taxes, tag, title and registration fees in the state where the vehicle will be registered. Prep and Reconditioning fees may apply. Offer good while supplies last. Mention this advertisement to the dealer to receive the advertised price. CALL TODAY 843-571-2810 TO CONFIRM AVAILABILITY. OR VISIT US IN WEST ASHLEY AT 1714 SAVANNAH HWY CHARLESTON, SC.<br><br>** EXCLUSIVE NATIONWIDE LIFETIME POWERTRAIN WARRANTY. UNLIMITED TIME AND MILES **, ** REAR BACKUP CAMERA **, **BLUETOOTH**.<br>2017 Nissan Titan 4D Crew Cab Black SV Clean CARFAX. CARFAX One-Owner. Priced below KBB Fair Purchase Price! RWD 7-Speed Automatic 5.6L V8<br><br><br>Price includes motor vehicle closing fee. Buyer is responsible for state, county and city taxes, tag, title and registration fees in the state where the vehicle will be registered. Prep and Reconditioning fees may apply. Offer good while supplies last. Mention this advertisement to the dealer to receive the advertised price. LIFETIME WARRANTY**, NISSAN CERTIFIED**, ONE OWNER**, CLEAN CARFAX**, USB CHARGING PORTS**, SMARTPHONE CONNECTIVITY - BLUE TOOTH, WELL MAINTAINED, **4X4**, Air Conditioning, Alloy wheels, AM/FM radio: SiriusXM, CD player, Heated door mirrors, Power steering, Power windows, Radio: NissanConnect w/SiriusXM & Mobile Apps, Rear window defroster, Remote keyless entry, Speed control, Speed-sensing steering, Steering wheel mounted audio controls, Traction control, Turn signal indicator mirrors.<br>Certified. Glacier White 2017 Nissan Titan SV 5.6L V8<br><br><br>Nissan Certified Pre-Owned Details:<br><br> * Includes Car Rental and Trip Interruption Reimbursement<br> * Warranty Deductible: $50<br> * Limited Warranty: 84 Month/100,000 Mile (whichever comes first) from original in-service date<br> * Vehicle History<br> * Transferable Warranty (between private parties)<br> * 167 Point Inspection<br> * Roadside Assistance<br><br><br>For more information or please contact JCUMBIE@mygastonianissan.com. Mention this advertisement to the dealer to receive the advertised price. At Gastonia Nissan we believe in "MARKET VALUE PRICING" all vehicles in our inventory. We use real-time Internet price comparisons to constantly adjust prices to provide ALL BUYERS The BEST PRICE possible. We do not mark them up, to mark them down! Contact JCUMBIE@MYGASTONIANISSAN.COM We utilize state-of-the-art technology to constantly monitor pricing trends in order to offer our shoppers the best competitive pricing and value. Our entire team is committed to helping you buy a car the way we would want to buy a car! We sell and service all makes and models of Pre-owned / Used Vehicles Used Cars, Used Trucks, Used Sport Utility, 10K under used cars, Cadillac, Ford, Chevrolet/Chevy, Honda, Toyota, Porsche, Land Rover, Jaguar, INFINITI, Audi, Nissan, Mazda, Hyundai, Chrysler, Jeep, Dodge, Ram, SRT, Mitsubishi, Lexus, Kia, Volkswagen, Mini, BMW, Mercedes, Fiat, Volvo, GMC, , Lincoln as well as other brands. Proudly serving the Gastonia and the greater Charlotte area and South Carolina area along with these great communities: Belmont, Mt Holly, Stanley , Cramerton , Dallas , Bessemer City , Kings Mountain, Shelby, York, Clover , Lincolnton, Huntersville, Rock Hill , Concord, Mint Hill, Matthews, Harrisburg, Indian Trail, Hickory, and surrounding areas.